I have some swatches of some gorgeous shades from an Aussie indie brand I've not tried yet. I've been really wanting to try some Glam Polishes, ever since I saw the polish Indigo over at Polished Peripherals. I don't have indigo to show you tonight (but I will share it soon), but tonight I have four polishes from the new Glam Polish - Me Oh My collection. First up is my favourite from this collection, Twilight Sparkle. It has lavender holo dots, stars and micro glitter and turquoise dots and micro glitter in a dusty purple base. Oh how I love me some dot glitter. I didn't manage to get any stars on my nails, but I didn't really try to fish anything out, so that doesn't surprise me. This was three coats topped with Seche Vite and photographed in the full sun. 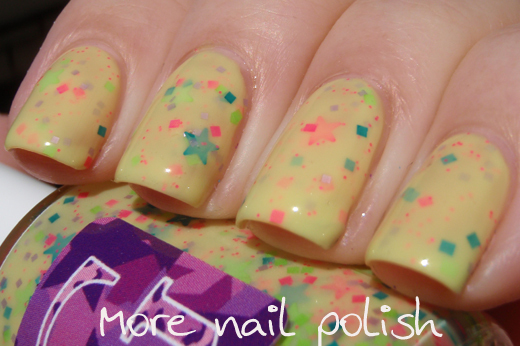 Margarita ville - a bright peach base with neon pink hexes, neon yellow squares & metallic purple hexes. The polish description from the big cartel store actually says the yellow squares are green, mine dont seem green at all, but maybe that some sort of crazy eye trick because of the bright peach base. This was three coats topped with Seche Vite and photographed in the full sun. Fern Gully - a blue leaning green base with neon green hexes, pink neon squares and butterflies and two sizes of white glitters. I was able to get a few butterflies out of the bottle without having to fish around, but I did notice this polish had settled a little and I probably should have given it a better shake before applying the polish. You can see in the bottle that a lot of the glitter is at the bottom. This was three coats topped with Seche Vite and photographed in shaded natural light. Starstrukk - This one has neon pink, neon green and turquoise stars as well as neon pink, neon green, turquoise & lilac squares and neon pink micro glitter all swimming around in a yellow base. The yellow base built up nicely in three coats and the was very smooth to apply. Yellows can often be problematic formula wise, but this was nice to apply. You may just need to make sure those stars are well top coated if you have very curvey nails. This was three coats topped with Seche Vite and photographed in the full sun. I really love these polishes and the whole package of polishes I received from Glam Polish is so bright and funky that it really sets a vibe for the brand. I love it when I can look at a bottle of polish from an indie brand and instantly see a connection between the polishes and get an insite into the person who makes the polish. I particularly get that feeling with Contrary polish, but I really feel it with these polishes too. You will see what I mean when I show you the rest of the bunch of Glam Polishes I have to share over the next week. There are some real beauties. Glam Polish is available in Austrlaia through the Big Cartel store. International orders can be placed through Mei Mei Signatures in Singapore. Oh my lord, I LOVED the Fern Gully movie as a little 'un. Fern Gully = drool! Eeeeep! I hope Llarowe or Ninja Polish start carrying Glam SOON! I adore Margarita Ville. And Fern Gully! Dang it I just ordered my first Glam Polish from Mei Mei Signatures (Star Candy) and now I am wanting several of them.